Beginning on January 1, 2019, auto repair shops in Oregon may need to obtain a surety bond in order to issue a mechanic’s lien when offering services to clients. The new requirement was introduced by House Bill 4087 in the beginning of the year, which was signed and passed in April. The bill redefines who is permitted to issue a possessory lien, and under what conditions. It also defines what owners of motor vehicles can do in cases in which no valid possessory lien is present, and they want to recover their vehicle. Read on for an overview of the bill’s provisions and information about the new bond requirement. House Bill 4087 introduces several important amendments to Chapter 646A of the Oregon Revised Statutes (ORS). In cases in which none of the above conditions are met by the person who issues a possessory claim against a vehicle, that person must have a surety bond in the amount of $20,000. The surety bond is required to guarantee that the owner of a vehicle against which such a claim is issued has recourse in cases in which they are wronged in some way by the mechanic. Under the bill, owners of vehicles can bring action against persons who do not release their vehicles in cases in which the latter do not have a valid possessory lien. If such a person has also changed the title of a vehicle, owners may also bring action to have the title restored. In addition, owners may be liable to obtain damages in an amount between $2,000 and $20,000, as well as have reasonable attorney fees and costs covered. Finally, owners of vehicles may also be able to obtain a judgment to have their title restored if it was changed. 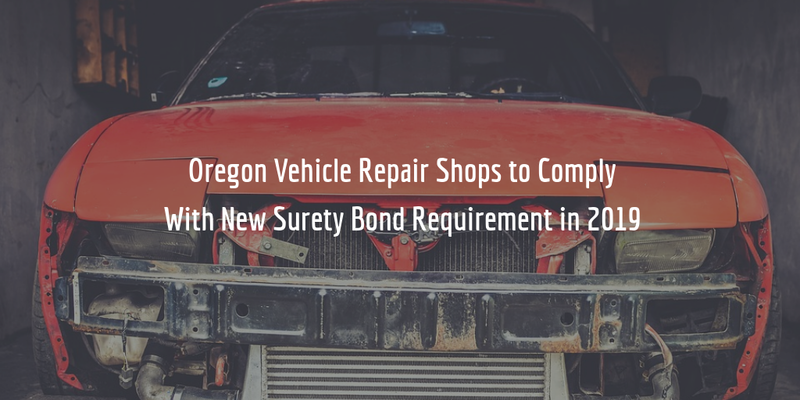 As of January 1, 2019, Oregon vehicle repair shops who do not comply with the provisions presented in the previous section, will require a $20,000 surety bond. The bond is a form of protection and guarantee to vehicle owners who leave their vehicles with mechanics. Such compensation may be necessary in cases in which the vehicle is further damaged by the mechanic. It can also be needed if vehicle owners are treated dishonestly by the mechanic causing them losses or damages. If this happens, owners can file a claim against the mechanic’s bond to request such compensation for the surety. Compensation extended by the surety can be as high as the full amount of the bond. Such compensation must then be repaid to the surety by the bonded repair shop in full. But the cost of getting bonded is not the same as the bond amount. The cost of getting bonded is equal to a small fraction of the full bond amount. It is determined by the surety when you apply for your bond largely on the basis of your personal credit score, though other factors are also taken into account. The higher your credit score is, the lower your bond rate will be. Want to get a free quote on your bond? Complete our bond form and we will shortly provide you with your quote!